The MacBook Pro has been a mainstay of the laptop world for years now. It’s known best for its relentless, forward-thinking design and significant power, especially for professional creatives. However, the 2016 iteration of the MacBook Pro wasn’t exactly well-received by its fans. The negative reactions centered around features like the removal of all ports other than four Thunderbolt ports and the jacked-up price thanks to the Touch Bar. In light of the fact that Apple rarely backs down from its commitment to new features and technology, the recent MacBook Pro has left a lot of people looking elsewhere for their next laptop purchase. If you look down your nose at the thought of putting a “gaming” laptop on this list, you haven’t seen the Razer Blade Stealth. This laptop was made to not only run high-powered graphics, but also to look respectable in a coffee shop or business meeting. The Blade Stealth is thinner than the MacBook Pro and lighter as well, making it more than worthy of sitting side-by-side with it. While there isn’t a 15-inch version, Razer does offer a 12-inch 4K model in addition to the 13.3-inch QHD model. The MateBook X makes for an easy comparison up against the MacBook Pro, most notably for its very similar design. 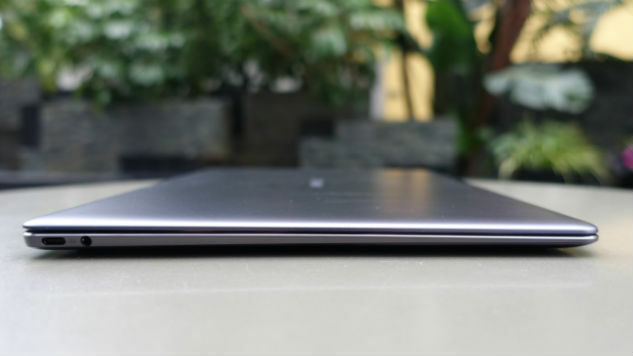 There’s no doubting that the MateBook X takes some generous influence from the MacBook with its unibody aluminum chassis, super-thin and light design, limited port availability (just two USB-C ports and a headphone jack), and fanless cooling system. It might be a better comparison to the MacBook than the MacBook Pro, but if you’re looking for something that actually looks and feels like a MacBook, look no further. The Spectre x360 does a number of things that the MacBook Pro doesn’t. Most notably, it’s got a 360 degree hinge, a stylus, and a 4K display—and those may or may not be things you actually want in your next laptop. However, what you get is a beautiful convertible laptop from a company that has really been nailing its industrial design as of late. On top of that, when you compare similarly-configured models from the MacBook Pro and XPS 13, the Spectre x360 turns out to be a better bang for your buck. In many ways, the Surface Laptop is Microsoft’s version of the MacBook Pro. It’s built from the ground-up by Microsoft and therefore feels like a product that fulfills a unique vision. The Surface Laptop looks very similar to the excellent Surface Pro and is one of the most beautiful laptops out there. It doesn’t quite have the performance punch that a fully-loaded MacBook Pro has, but it comes comes at a comparably discounted price at just $999. It should be noted that the Surface Laptop comes loaded up with something called Windows 10 S, which has limited functionality in terms of what software you can use on it. However, you can easily upgrade to the full version of Windows 10. If you’re looking for a laptop that not only competes with, but actually outshines the MacBook Pro, the Dell XPS 13 is your best option. It’s not that the XPS 13 is anything flashy, in fact, the lid and keyboard are fairly simple (not unlike the MacBook Pro). The XPS 13 also has a very similar size and weight to the MacBook Pro—and even comes in at similar price points when configured with the same specs. The one difference in price is that Dell offers an entry-level model at just $799. The real place where the XPS 13 shines though is the display. One look at the screen on this things and you’ll never want to use another laptop again. Not only is it QHD, it’s also got significantly-reduced bezels on the top and sides, making the viewing experience that much more immersive. It’s the Galaxy S8 of laptops and it’s enough to make the Dell XPS 13 the standout for alternatives to the MacBook Pro.